“She says,”Amma, my head is going to burst now! She holds it tightly and bites the pillows to relieve the pain somehow! "Are my bones breaking into pieces? she asks because she can hardly move. 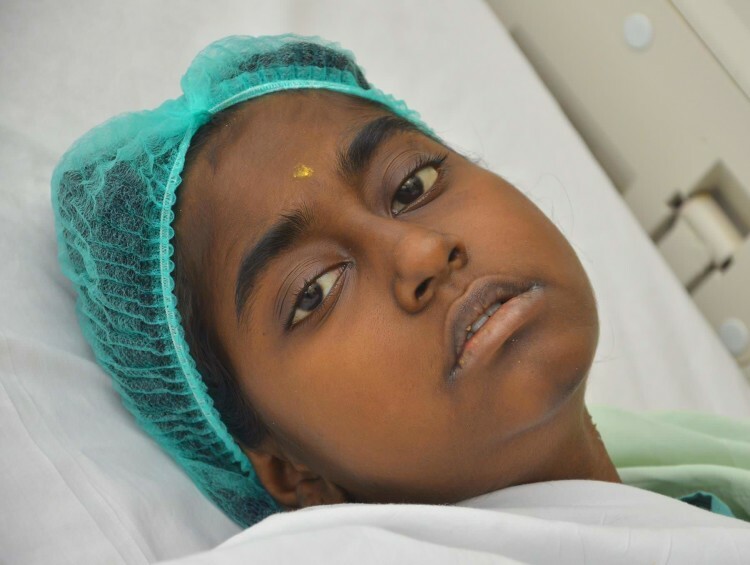 Ishwarya was almost on the verge of a complete recovery thrice but the pain seems to have latched onto her. She is losing the will to fight and ends up asking everyday, “Am I going to die?” - Jagathammal. Ishwarya is 17- years-old now. Her struggle for life started when she was just 9-months-old. Her urine was dark yellow in color and she began to bleed. She was diagnosed with Primary Hyperoxaluria which means she will keep developing stones in her kidney and bladder. For 12 years, Ishwarya was on medicines to control kidney stone formation. When they thought she was fine, she began having severe headaches, vomiting and fatigue. Reports confirmed that both her kidneys and liver are severely damaged. "Diabetes runs in our family. Only I was healthy enough to donate my liver in 2016. Ishwarya also had a kidney transplant. 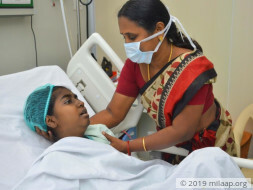 After 3 months, she developed infections around the new organs and was back on the transplant list." “Ishwarya has been on dialysis for 4 years. She has to go thrice a week and spend hours getting her blood purified since her kidneys are not functioning. Unable to go to school, she is in constant touch with her teachers and friends over phone. Despite being in a lot of pain, she scored 80% in her 10th grade. She is always studying in the hospital, even though the doctors have advised rest." 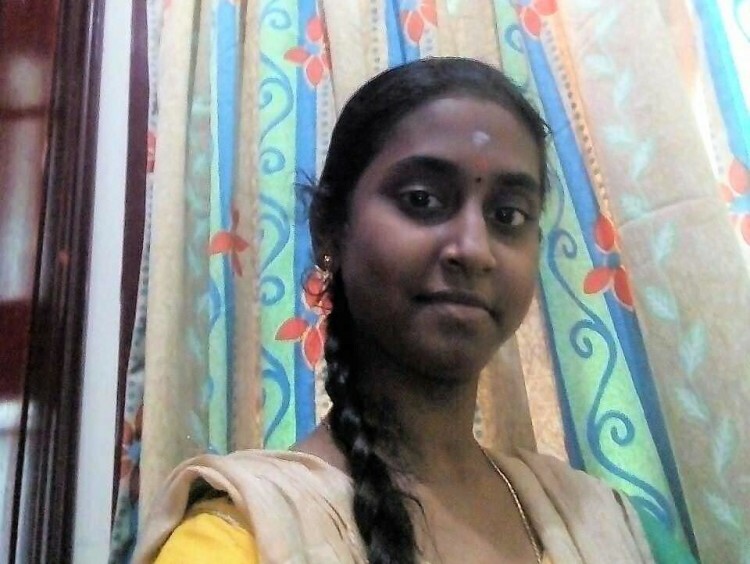 After the second kidney transplant, Ishwarya went into rejection. An infection has caused persistent bleeding around the transplanted kidney, putting her in ICU. Ishwarya’s parents are from Karaikudi. They have come down to Chennai for the treatment and have rented a room. She has an elder sister Kowsalya (18), and a younger brother Manikandan (12), who are with their grandmother. Jagathammal is slowly losing her hope of bringing her daughter back home. Ishwarya’s father Pandidurai had a tea shop in Karaikudi. He left his job and came to Chennai for treatment. He has sold everything he had. He is now a daily wager worker, managing to find odd jobs every day. Everyone has done everything to save her life and now they need your help. She needs to stay in the ICU for 10 days and her treatment costs would amount to Rs 20 lakhs. The family cannot afford to pay. 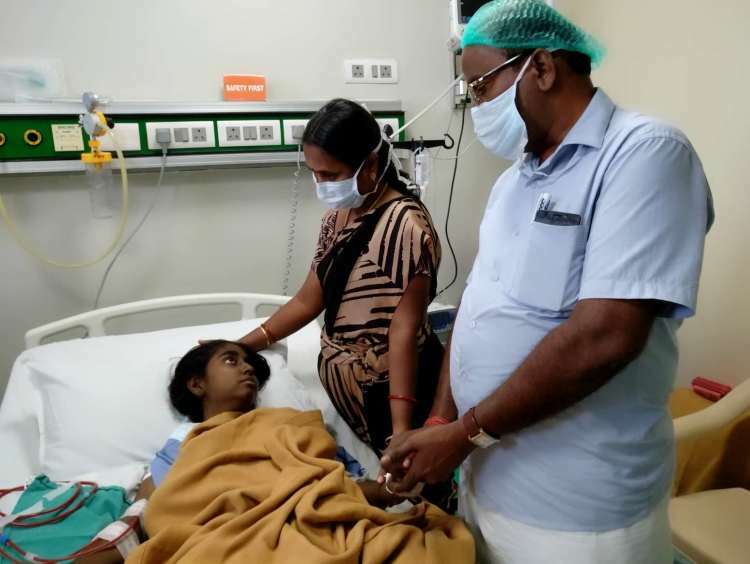 If she does not continue her treatment, all the pain, trauma and struggle Ishwarya went through and all the efforts her parents had taken to save her life every single time would go in vain. She deserves a life. Your contribution can give Ishwarya a chance to live her life! Unfortunately, with inexplicable grief, we're having to inform you all that Ishwarya passed away. She stopped responding to the treatment being given to her which eventually started causing complications. This worsened her health and we eventually lost her. The funds raised were utilised towards her treatment so far. Thank you everyone for your love. Her family needs our support in this unfortunate time. 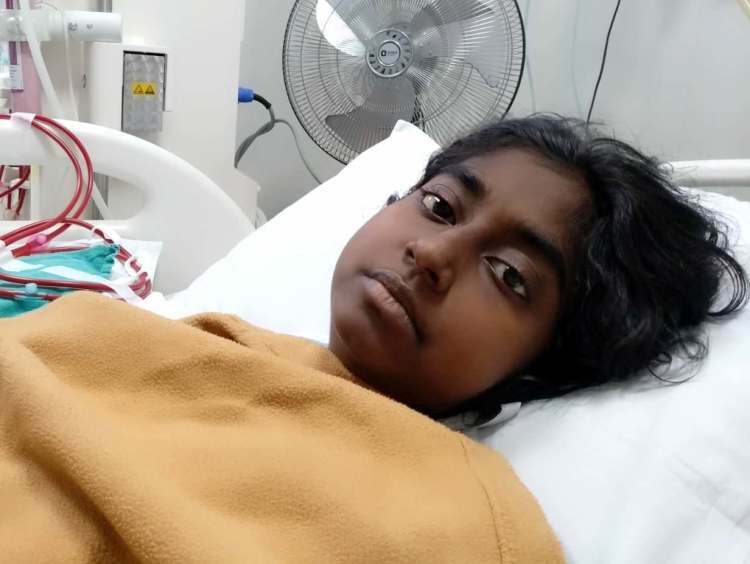 Ishwarya is currently doing better. 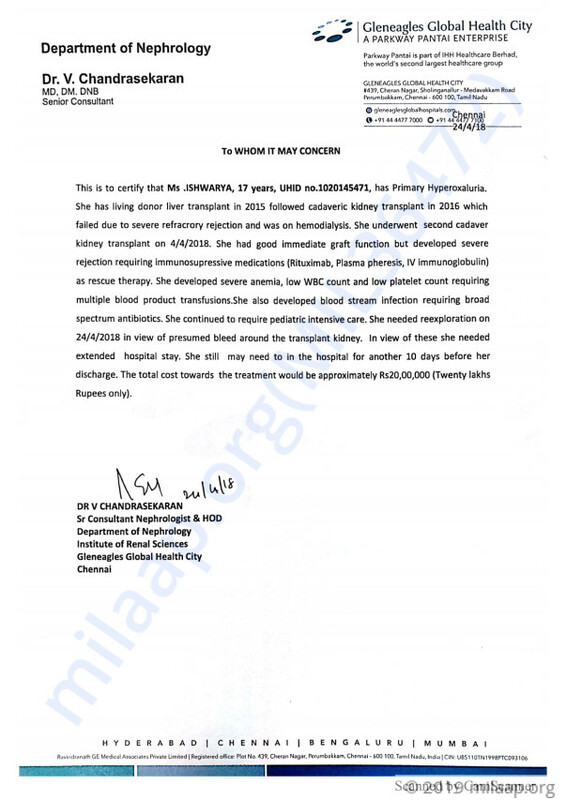 She successfully underwent surgery wherein her kidneys were removed which were infected. She is is still in the hospital for now. We are currently waiting for a donor as she is back on the transplant list. Post which, she will be undergoing a kidney transplant once again. The doctors have told us that she is likely to get transplanted in about 2-3 months' time. Please keep praying for her. We shall keep you posted.